I enjoyed reading about Martin and Ruby Gallagher. My Gran and Grandad lived at 28 Arthur St. and as a child I was often sent to the little shop. It was a happy place, Ruby was always singing. My Gran never called her Ruby Gallaher it was Ruby Deaton. Also in Arthur St. were Mrs. Quinn, Mrs. Jolly , Mrs. Nanncarrow and the Wallige family. They were friendly with the Young family who lived in Whitehouse Lane. The place I liked most was the Co-Op Store. I think the Manager was called Kilpatrick. Sometimes we had to go upstairs to the shoe dept. It was like an Aladdin’s Cave. All kinds of boxes and drawers, I would have loved looking inside them, but all my Gran ever bought were Portland shoes. Another of my favourite places was the Empire Cinema. Upstairs, at the front, my head on the wide rail watching anything and everything, and a bag of Cherry Lips, magic. My Gran kept the Doctors surgery when it was in Arthur St. Does anyone remember Dr. Dickinson? He was there when Dr. Millyard came to Ushaw Moor. 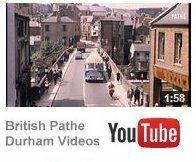 Anyone wanting the Dr. would phone my Gran on ‘New Brancepath 202′ and leave a message for the Dr. to call.Other names from my early years in Ushaw Moor are Billy Defty, Tommy Hall, John Aberdeen and Susan Lough. Susans’ family had the shoe shop on Station Rd. Did anyone go to the Christmas parties at the Baptist Chapel? They were great fun, games and food, all home made by the ladies of the Chapel. We all had to wind different coloured cotton around our knives forks and spoons so that we didn’t get them mixed up. They were held in the school room of the chapel, it seemed huge. The tables were set up on tressles, and everyone contributed plates and bowls, I wonder if they were returned to their owners? Well I hope I have set some memories stirring. My Gran and Grandad were Janet and Jo Henderson, my Aunt Cissie and Uncle Jack lived next door at No.29 Arthur St. My Mams name is Peggy Elliott and she lives near me in Billingham. Looking forward to reading some more memories. via Memories of Ushaw Moor: November 2004. 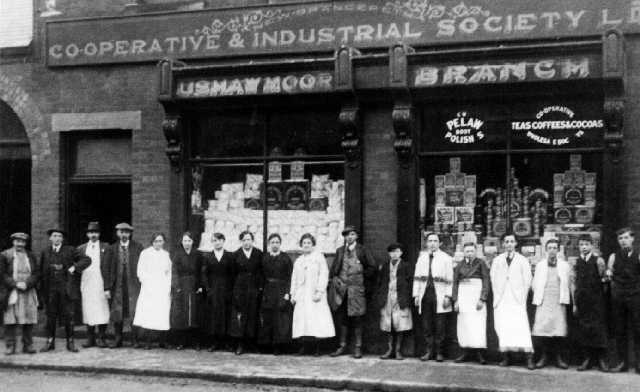 Tonight I would like to concentrate on the building where Mc Cormicks shop is now situated in Durham Road. This building was constructed in the years leading up to the First World War by the New Brancepth Cooperative Society. If we start from the first department of the store from the Broompark end then this was the Greengrocery department. There was a female employee worked in this department but I cannot remember her name. Next was the Butchery Department. The butcher was Norman Ridley and he lived in a flat behind the Butchers shop. The butchers shop was huge and in the war years when I was a child there was a lack of fresh meat. The shop was spotless and you could literally eat your food off the floor. (My Dad was serving his time as a bricklayer in 1915 on this site when as an eighteen year old boy he volunteered for the Army and enlisted with the Royal Northumberland Fusiliers.) The thing that fascinated me as a young child was the size of the walk in fridge in the butchers shop. There were no domestic fridges in those days; it was the first fridge I can remember. Next to the Butchers traveling towards the Flass was a loading area which was used among other things to take goods up to the Hardware Department upstairs in the store by means of a pulley system. The main door to the store led into the Grocery and Hardware Departments. The stairs leading to the Hardware Department rose directly from the main door. It was a very limited magic world of shoes, bedding, lino, furniture, cloth, buttons, cottons, and high ceilings. The man in charge was Eddie Manford whose family originated from Pringle Place at New Brancepeth. If you turned to the right inside the main door you entered the magic world of the Grocery Department. Butter and cheese came in barrels in those days, the wooden barrels were stripped from their contents and the butter or cheese was cut into portions with thin steel wires. Everything was measured out and placed into strong paper bags and it was magic to watch sugar, flour, raisins, currants, biscuits, and other commodities expertly weighed and bagged very quickly. The men behind the counters were known personally, Kit Kitchen Billy Calvert amongst them and they were on first name terms with all customers. The bill was made out by the server but you took the bill to the office. The “office” was a small area enclosed by a wooden partition which looked out onto Durham Road. There was a small hatch where the transaction took place. The lady, again I cannot remember her name took the bill and asked for your check number. She then gave you a small paper check which registered the money you had spent The smell in the different departments were magic, numerous unwrapped commodities side by side, they blended to create individual smells for each Department. Last but not least was the Cobblers, this situated on the gable end of the store where the road led down to High View. The smell of leather and chemicals in the polishes was magic, plus the sound of the high speed lathes, or a knife cutting leather and the nails being hammered into the leather repairs. Danny Henderson from Mew Brancepeth worked there and I knew the cobbler as “Cody” who I think came from Esh Winning. Our check number was 27. An article on the “Dividend” is in the pipeline. I hope readers enjoy this and add their own memories to this excellent website. Please add to this article.